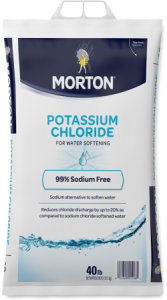 Morton® Potassium Chloride Pellets provide an effortless way to soften your water while reducing sodium and adding potassium to your softened water. Potassium Chloride is 99% sodium-free. Using Potassium Chloride Pellets reduces sodium levels in your softened water and chlorides discharged into the environment. It also provides potassium, an essential nutrient.